One of the problems of living on chalk which is a very crumbly porous rock, apart from landslides, is having access to fresh water. Quite apart from people’s needs there were also the horses – several Chapel Hill houses during the 19th century had stables attached – we know there was a stable behind the chapel and one at No. 24 and there may have been others. Many of the houses on Chapel Hill had wells which were dug deep into the chalk bedrock. Some had pumps attached, others must have required a bucket to be lowered. 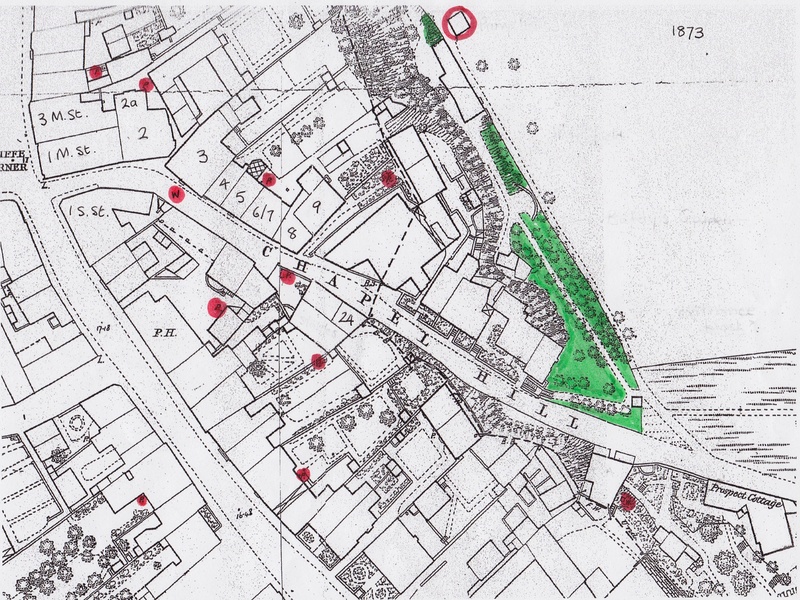 Several of these are shown by the red dots on the 1873 map below. Outside Lamb House, under a manhole cover in the middle of the road, is a deep stone-lined well which used to supply the pump outside St Thomas’s Church. It is described in Rev Thomas Horsfield and Gideon Mantell’s History and Antiquities of Lewes and its Vicinity, Vol.1, 1824, as follows; ”At a vestry holden on 24th of July, 1804, pursuant to notice, it was resolved, ‘that a public pump should be erected near the church porch.’ The pump thus erected, formerly stood close to the church porch, but on pulling down of the market house, it was removed to the east end of the church; it is supplied from a well in the centre of the high road leading up the hill, at about 20 yards from the Cliffe corner. The water is of very excellent quality, and conduces much to the comfort and health of the inhabitants.” The pump outside the church is dated 1830 and is presumably the one described above or its immediate successor. The well outside No. 3 is very easily spotted in snowy weather when the geothermal warmth rising from its depths keeps a patch of road snow-free. When new water mains were being connected in 1995 a trench had to be dug down the whole length of the hill. As they dug outside No. 3, a pneumatic drill suddenly shot through into apparently empty space below. Excavations revealed the well. Photos taken at the time show the curved stone walls of the well and the water at the bottom in addition to a network of pipes and the stone “biscuit” with which the well was eventually capped. During the 2000 floods water rose out of the well and poured down the road and in 2013 when the pipe supplying No.3 became partly disconnected the leakage went into the well and saved the cellar of that house from flooding.